The music industry knows disruption very well. The Walkman led to cassettes outselling LPs. CDs – with their promise of “perfect sound forever” – were outsold by downloads, and the spotlight is now on the music streaming industry, particularly after Spotify’s successful IPO. 64% of internet users listen to music streaming services, rising to three-quarters of 16-24s. With the growth of smartphones and robust data networks, streaming services have never been easier to access, and fit well with music fans’ lifestyles. 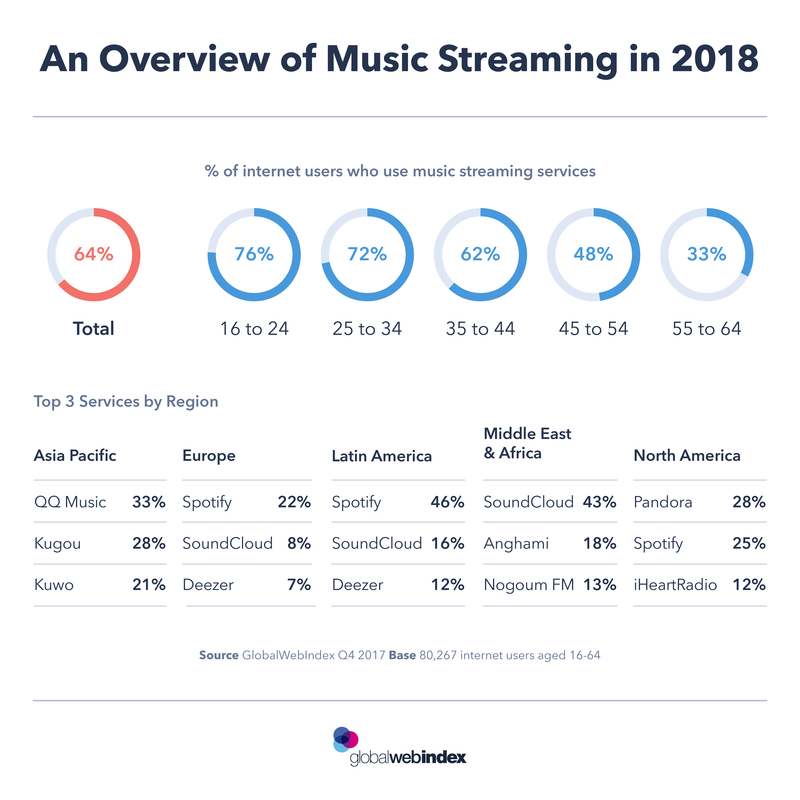 Spotify’s IPO may have grabbed the headlines of late but the global streaming market is a diverse one. As with most online media, China has its own offerings, with Tencent’s QQ Music the market leader. Pandora takes the crown in North America, while SoundCloud leads in India and dominates the Middle East. This global diversity shows the importance of providing regionally relevant content, and allowing local artists the best platform to distribute their music. But just as streaming hits the headlines, the industry may have to reinvent itself once more. Spotify is dabbling in podcasts, video and offering a bundle deal with Hulu, and Apple is focusing more on in-house media amid a slowing hardware market. To reach profitability, loss-posting services might just have to expand as multimedia platforms with diverse formats on offer.